The Organizational Session opened in Montgomery on Tuesday with both legislative bodies electing their leadership and establishing operating rules. All standing committees in the House and Senate were assigned and Marshall County legislators received a diverse mix of committees which they will work on for the next four years. Senator Clay Scofield will be the Chairman of the Senate Confirmations Committee. He was also appointed to seven other committees including Agriculture, Conservation and Forestry; Rules; Governmental Affairs; Fiscal Responsibility and Economic Development; County and Municipal Government; Ethics and Conduct; and the Transportation and Energy Committee. In the House, Representative Kerry Rich (Dist 26) will serve on Rules and will be Chairman of the Resolution Sub-Committee which is a part of Rules. He will be Vice Chair of the Education Policy Committee, which he has been on before. As a part of that committee, he will serve as Chairman of the K-12 Sub-committee. He was also appointed to the Ethics and Campaign Finance Committee and as Chair of that committee’s Campaign Finance Sub-Committee. “I was especially pleased to be named to the Rules Committee again. And, as Chairman of the Resolutions Sub-committee we will review every Resolution that comes before the House,” Rich said of his committee responsibilities. Representative Will Ainsworth (Dist 27) received appointments to the Agriculture and Forestry Committee; Utilities and Infrastructure Committee; and Ethics and Campaign Finance Committee. Representative Randall Shedd (Dist 11) will serve as Vice-Chairman of the House Children and Senior Advocacy Committee and as Chair of the Senior Advocacy Sub-Committee. Shedd says, “I have a lifelong passion for these issues and I look forward to putting my energy to work on the state level and hopefully make a positive difference.” Shedd was also appointed to the House Financial Services Committee; the Local Legislation Committee; and has been selected as an officer in the House Rural Caucus where he plans to work on finding solutions to issues for rural and small towns. Representative Ed Henry (Dist 9) will serve on Ways and Means Education Committee, Education Policy Committee, and State Government Committee. Scofield says he looks forward to working on many important issues with the members of the Marshall County Legislative Delegation. “I believe the various backgrounds and experiences of these gentlemen and the multiple committees we will be working on collectively will give Marshall County an excellent representation in Montgomery,” he said. The Regular Session will begin on March 3rd. 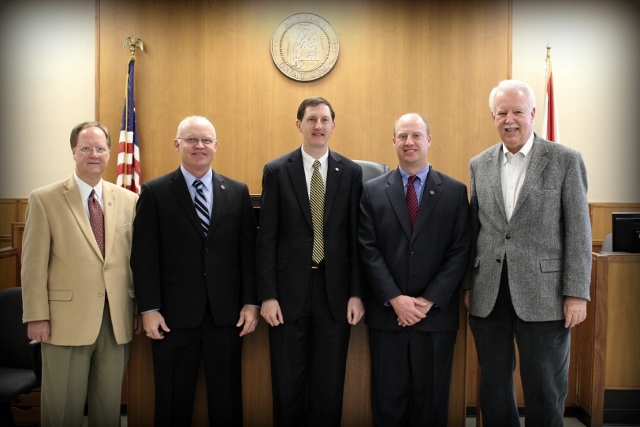 ** Pictured above l-r: Rep. Randall Shedd, Rep. David Standridge, Senator Clay Scofield, Rep. Will Ainsworth, Rep. Kerry Rich (not pictured, Rep. Ed Henry).